Poverty is a problem faced by both individuals and society. Societies commentators are an exclusive group, selected via a hierarchy and instated within a system, how representative can their voice be of the individuals who, because of the restrictions of their experience, do not rise through this? The stories that find there way into the mass media produce a profound impact on the public subconscious; all mediated by the editorial chain, with whom the conditions are set and must be met to be accepted. The commissioning editors of both BBC and Channel 4 documentaries present similar priorities in their commissioning guidelines: Their requests come in loaded language – requesting proposals to match. Hamish Mykura, Head of Documentaries for More 4 lists ‘harrowing’ ‘obsessed’ ‘extreme’ and ‘compelling’ in the descriptions for previous successes, the titles of which are equally charged (Eight Minutes to Disaster, Killer in a Small Town). Alternatively, there is a focus on the ‘cheeky’ (BBC3) or the BBC4 equivalent ‘witty’, with both seeking ‘onscreen talent’ just as Channel 4 emphasises ‘presenter-led’ documentaries; encouraging programmes that are less focused on informative or critical worth and more (as requested by BBC3) the ‘entertainment values in their DNA’. None of these criteria are detrimental in themselves but with this blanket approach to issue based programming, there is an obvious conflict of interests, the end point of which is arrived upon by Mark Raphael. Mass appeal and commercial viability, are not criteria that encourage varied and responsible reporting. Industry checks may happen but if the material never leaves this sphere, pre-public release, there can be no dialogue. Fact checking, largely to avoid any potential legal repercussion, only happens to concrete information, not implication and is far more perceptible in specific rather than abstract cases. Where backlash does happen, it tends to pass more quietly than the impact of the broadcast programme. When RDF went head to head with the Queen (A Year with the Queen, BBC, 2007) the BBC placed all blame with RDF, whose misleading editing meant producer, Stephen Lambert’s, head rolled. Now he’s back (as Studio Lambert) with Benefit Busters and RDF are free to continue with programmes, Wife Swap and The Secret Millionaire. It is not the representation, but the victim and resource with which they can respond, that affects the reaction – but the personal harm and perceptual effect is no less dramatic for those without recourse. The power the media wields in propagating and reinforcing hegemonic ideals has long been recognised: The veil of entertainment and pretext that responding to audience choice, removes the onus from the media, only highlights the need for institutional change. The storm… after the calm. Para leer este blog en español pincha aquí. The day starts early for us, but the excitement charges our batteries more than the first coffee of the morning. The Director, 1st AD and Producer Assistant all meet in the office. We pick up the props and head off to North London. Some of the actors arrive really early too. They were also concerned about the usual transport surprises and prefer to arrive too early than not arrive at all. They make themselves comfortable upstairs and get to know each other. It will be a long wait. The beginning of the shoot is hard to get right. It is the key moment when most of the lighting has to be set up in the proper place. Some feelings characterize the first hours of the shoot, perfectionism and optimism. This is not bad, but it can entail some problems: we can easily run out of time. We all need to focus. The lunch break keeps being put off and people start getting nervous. Finally, we take the break and everybody seems satisfied with the job done so far. The moment arrives to shoot the takes that made us to come to this location: the ones around the glass ceiling. The extras exchange contact numbers and leave the space. Shots from “under the glass ceiling” work perfectly. Nevertheless, we are using some extra time that we haven’t contracted with the landlord, so we call him asking for one more hour. Costs start to rise, but we can’t let the pressure to drive us to take hasty decisions that will lead to problems in editing. We move upstairs to shoot from “above the glass ceiling”. Lights are ready, camera in position, actors prepared… and suddenly, without prior warning, the camera switches off. We are already using a second extra hour. Karim, the landlord, arrives to the location. “We are having some technical problems”, how many times has he heard that excuse? Fortunately, the camera starts working again and we are able to take the last shot of the day. Have we got everything we need? We think so. We tidy up, clean everything, put the furniture in place again… and leave the location. We talk about the day on our way back home. We are tired and a bit worried about having used two extra hours, but this is a normal issue in film production. The next shooting day will be at Brunel University. We will use their green screen. It will be a quieter day and every take will be more planned because every shot has to be from specific distances and angles. There is no room for improvisation. On the plus side we don’t have time limit to use these premises so there is more time to get things right. It seems that it will be a journey without mishaps, but we won’t count our chickens before they are hatched. If you want to see the pictures of the shooting, click here to visit flickr. If you want to see the first samples of the video, click here. If you want to get more information about the project “Speak out against discrimination”, click here. For more information about Spectacle, click here. Deja tus opiniones en español aquí. Editing has started and we need to know your opinion. If you want to see the progress, you can see the first, second, third and forth edit in the project web site. Any suggestion, opinion, criticism will be welcomed. 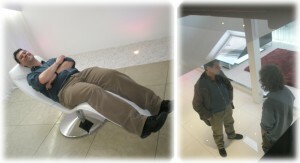 So what’s the conclusion from the director of photography after having visited the location with the glass floor? Does the CGI expert agree with this space? We now depend on these people to take the next steps. Once again we’re at a standstill and, considering that we’re running out of time, being unable to do anything is really stressful. The worst of all is to know that maybe the conclusion will be that we have to go back to our previous plan, forget about the location with the glass floor and order the perspex. This would mean that we’ve been wasting time that we don’t have just to end up going back to the starting point. It seems to fit our requirements, but the CGI experts, Dave Barnard and Alan Marques, have the final say. Fortunately, after a few days, we receive some videos that make everything much clearer. They are the pre-visualization of the shooting in the location and in the studio. Alan has made 3D simulations of the shooting that are really useful. All the creative decisions now become technical decisions and the pre-visualizations wipe out the charm of the uncertainty, but I think we’ve had enough uncertainty so far, so we’re really pleased with these videos. Or watch them in our web site. Thanks to this, we now know which lenses we need, the distance and angle of the shots… we even know how tall our actors have to be! Finally, we can happily say that this is REALLY up and running. On the other side, the moment has arrived to speak with the owner of the location, and that’s something that we’re a bit concerned about. We’re really enthusiastic with the idea of shooting the video in that place, but… what if he is not as keen on it as we are? What if he doesn’t like more than 20 people wandering around his house, with a lot of cameras and lighting and food? (yes, it’ll be a long working day and we all need to eat at some point). We visit the location wearing our best smiles and promising to behave. We take the measure of the glass, try different lenses and angles… and speak with the landlord. It’s a tricky issue because this location is his house, and he’s had bad past experiences with big production crews, so he prefers small photographic projects. He’s concerned about the implications for the neighbourhood. We get to an agreement and he even gives us some advice regarding the catering. Things are looking better… or are they? Dave Barnard relaxing for a while and discussing some points with Mark Carey below the "Glass Ceiling"
Suddenly a dark cloud sets over our heads. The focus puller calls saying that he’s been offered a 3 day job in Italy. We’re just offering him a 2 day job in Clapton. Mark, the Director of Photography, asks us to sort it out, even to put off the shooting day. No, that’s not possible. We’ve already contacted the actors, the Council of Europe, the other studio… Mark trusts in this focus puller and thinks he’s a key factor in this project. We’ll use state-of-the-art technologies and he only feels sure working with this guy. Few people know how to work with these equipments. Once again we see how many important people there are behind a film, while all we’ve dealt with so far is a few actors. If you want to read the English version, click here. ¿A qué conclusión ha llegado el director de fotografía después de haber visitado la localización con el suelo de cristal? ¿Qué opina el experto en infografía acerca de la validez de tal espacio para aplicar luego los efectos visuales? Cualquier decisión que tomemos ahora depende de lo que estos dos miembros del equipo decidan. Una vez más nos encontramos inmovilizados y, teniendo en cuenta el poco tiempo del que disponemos, resulta estresante no poder hacer nada. Lo peor es pensar en la posibilidad de que la conclusión sea que tenemos que volver al plan anterior, olvidarnos de la localización con el suelo de cristal y encargar el plexiglás, porque eso significaría que hemos perdido tiempo del que no disponemos para acabar volviendo al punto de partida. Parece que se ajusta a nuestras necesidades, pero todavía no está todo dicho: la última palabra la tienen los expertos en infografía. Afortunadamente, tras unos días de espera, nos llegan unos vídeos que arrojan un poco de luz sobre el camino a seguir. Se trata de unas previsualizaciones del rodaje en la localización y en el estudio del chroma key. Alan Marques, uno de nuestros infógrafos, ha generado unas simulaciones 3D del rodaje que son infinitamente útiles. Realmente podría decirse que esto atenta contra la esencia del cine como la fotografía digital lo hace contra la analógica. Todas las decisiones creativas se convierten en decisiones técnicas y en previsualizaciones que quitan todo el encanto de la incertidumbre, pero creo que de incertidumbre estamos bien servidos, así que no podemos recibir estos vídeos sino con mucha alegría. O verlos online en nuestra web. Gracias a esto sabemos qué tipo de objetivo necesitaremos, la distancia y ángulos desde los que deberemos filmar… prácticamente sabemos incluso cuánto deberían medir nuestros actores. Ahora sí, por fin, podemos decir que todo está en marcha DE VERDAD. Por otra parte, ha llegado un momento que hemos temido desde la última reunión: tenemos que hablar con el dueño de la localización. Todos estamos muy entusiasmados con la posibilidad de rodar allí el vídeo, pero… ¿y si a él no le emociona tanto la idea? ¿Qué pasa si no está de acuerdo con que más de veinte personas se hagan con su casa y la llenen de cámaras, luces, comida…? (sí, al fin y al cabo será un largo día de trabajo y todos necesitamos comer en algún momento). Visitamos la localización con la mejor de nuestras sonrisas y prometiendo ser buenos. Tomamos medidas, barajamos distintas opciones respecto a ángulos y objetivos… y lidiamos con el dueño del lugar. Se trata de un tema particularmente delicado porque de hecho esta localización es su casa, y ha tenido malas experiencias pasadas con grandes equipos de producción, por lo que siempre prefiere ceder su espacio a pequeños equipos de fotografía. Se trata, sobre todo, de una cuestión de respeto de cara a sus vecinos. No hay problema, accede a nuestra petición y nos informa además de cómo podemos organizar el catering para el día del rodaje. Las cosas no podrían ir mejor. ¿O sí? De repente nuestras expresiones se hielan. El 1er asistente de cámara llama diciendo que le han ofrecido un trabajo de tres días en Italia. Nosotros sólo le ofrecemos trabajo para dos días. Mark, el director de fotografía, nos suplica que encontremos una solución a este problema, incluso que pospongamos el rodaje. No, no es posible. Ya hemos contactado con los actores, con el Consejo de Europa, con el otro estudio. Mark confía ciegamente en este 1er asistente de cámara y considera imprescindible su colaboración en este proyecto. Usaremos una tecnología muy nueva y sólo se siente seguro si trabaja con él, ya que pocas personas conocen estos equipos. Una vez más se demuestra cuánta gente realmente imprescindible hay detrás de los vídeos, cuando realmente la cara que vemos es tan sólo la de unos pocos actores. Para obtener más información acerca del proyecto “Speak out against discrimination”, pincha aquí. Para obtener más información acerca de Spectacle, pincha aquí. Everything seems to be on the right track: we’ve found a studio and we’ve decided to get the perspex structure. The studio also offers some extra services that will save us time researching camera and lighting equipment. Perspex has also some advantages compared to the glass: it’s easier to get it and we just need to order it a couple of days in advance (whereas we would need to order the glass with at least 15 days in advance). Summing up: we are all really pleased and “relaxed”. It’s a good time to start working hard on the shoot schedule. We get hold of the breakdown, we group the shots depending on the actors and on the technical requirements in each of them. It would be perfect if we could work just one day with all the extras and another day with the main characters. Then we could save some money as we wouldn’t need eight extras working during two days when their role of strolling in front of the camera, even if it’s crucial, can be done in one morning. By “technical requirements” I meant the shots will need the perspex structure. Fortunately, both of the factors are compatible: the shots where we need the extras don’t need the perspex structure. Green screen shooting and perspex structure. We are already so familiar with the project that everything seems obvious, but it’s hard to explain with words each shot, so there’s no point in trying to do it. It’s much easier and intuitive to download the shooting plan so you can get a literal view, with color, design, and all that stuff that makes things more user friendly. A picture speaks a thousand words. So if you want to see the first draft of our shooting plan you just have to click here. If these plans go ahead it will also mean that we would be saving circa £1000 in our casting. But this doesn’t mean that the company would profit; it just means that the money is moving from one point of the budget to another. In short, it’s not bad news, but it’s not excellent either. Good, good, it looks like the project is up and running. Now we “only” need to book the studio, get the actors there on time, order the perspex and start hiring technical staff. That’s nothing! Is it possible to paint it green? How much will they charge for this? Is it available in the shooting days? How many days in advance do we need to book it? Do we have to pay a deposit? Eventually we have a list of studios scattered all over the city. As we have a very tight budget we have to focus on to the most affordables ones. Once again we are working with words, suggestions, ideas… everything is too abstract. We need to go and see the studio and decide if it fits our requirements (if we really know which our requirements are!). Oyster Card is popped in the pocket and we set off to Norh London. There we meet the CGI specialist. Coffees, decisions progressing, decisions going back, redesign of some shots… “We should shoot this with a chroma key. No, this one is better with a white background”. Scribbles, deletions, drafts… This video is constantly changing and sometimes it is one step forward and fifty steps back. It is midday and we head off to the first studio hoping to find the answer to all our questions. Its too small! Sometimes it seems that we will never shoot this project and all that we are doing is wasting our time, but we cannot get demoralized. Hopeful, we go to another nearby studio. We haven’t made an appointment, but the studio are professional and friendly and answer our questions. Things pick up, it seems that we have a place to shoot our video. On our way home we write down which shots will need chroma key and which won’t, so we can make the shooting schedule and give them a time and date. We must take the right decisions in order to optimize time and money. 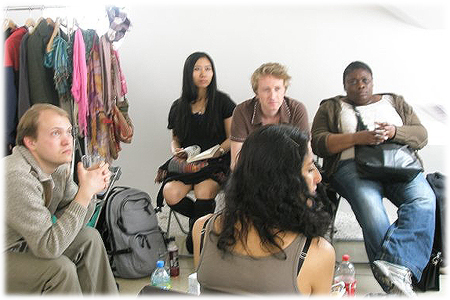 We don’t want 13 actors strolling in the studio for 2 days when most of them can do their role in one single morning. So now that we all know what we are doing, we need to know how to do it, and that can be a whole other kettle of fish. Ok, so we need a lot of people (mental note: have an audition! ), and we need a studio (start making phone calls), AND we need a big glass ceiling (Do we need a greenhouse?). This starts to look difficult, but we love challenges, don’t we? 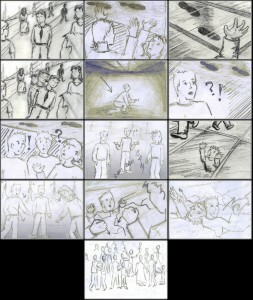 The storyboard has been an important step forward for the project. We’ve realised how important the CGI (Computer Generated Images) will be and our meetings with the specialist in computer graphics have revolved around the storyboard. Meetings… this reminds me that evening in March when the director said: “Welcome to the night shift!” Long evenings in the office and early coffees in Camden around a table plenty of drafts… The best thing about this is that no one loses their optimism, there’s always someone able to put a smile in your face even when everything goes wrong. Eventually, we’ve realised that we need to make some changes. How can something that we created to help us turn against us? We’ve been too obsessed with reproducing an accurate version of the storyboard, and that’s the problem. We can adapt the storyboard to our necessities, so let’s try to start with the creative thinking and redefine the shoots. First of all, we still have some problems visualising the proposed video. We’re used to moving pictures, and a piece of paper doesn’t help too much. Making this has helped us notice that we’re missing some really important stuff, the sound!